Daveluy produced card games between c.1840 and 1890. His output differs from other Belgian manufacturers by its distinctive fantasy medieval style, lively chromolithography, traditional ideals of workmanship and de luxe finish. Unlike his contemporaries in Turnhout, Daveluy favoured graphic originality with a penchant for the “neo-medieval” and “neo-Renaissance” which was becoming fashionable at that time, evoking an old order of chivalry and adventure. Many of Daveluy's playing cards have historical connotations with reference to the history of the Southern Netherlands, and show figures with a landscape background. Where the Turnhout manufacturers borrowed from French and Continental patterns and addressed the wider world, Daveluy addressed Belgium of the 1830s. 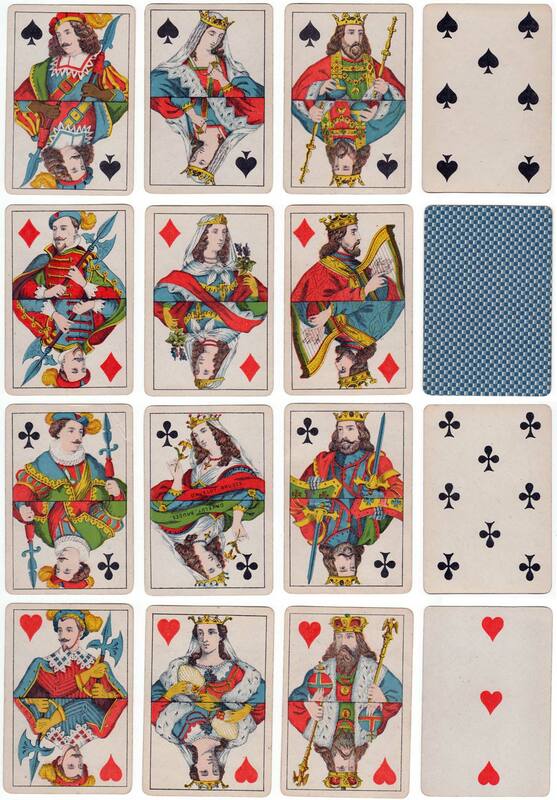 However, many of his fantasy playing card designs influenced the output of other manufacturers who imitated his style. Above: fantasy double-ended designs by Daveluy, Bruges, c.1860-75. Traditional ideals of workmanship with different colouring at each end (click image to see more). Cartes à Jouer de XVIIe au XXe siècle, Collection Atger, Etude Tajan, 2000. Mann, Sylvia: All Cards on the Table, Jonas Verlag/Deutsches Spielkarten-Museum, Leinfelden-Echterdingen, 1990. Édouard Alexis Daveluy (1812-1894) founded his press in Bruges in 1835. Having been appointed Lithographer to the King, in 1847 he filed a patent for “a method of manufacturing playing cards in chromolithography”. We might even go so far as to say that Daveluy challenged the concepts of progress associated with industrialisation and pursued his own ideals. Daveluy exhibited in Paris at the Universal Exhibitions of 1855, 1867 & 1878. He also produced Lenormand & Tarot packs. Around 1880, Édouard Daveluy transferred the business to his eldest son Victor (1846-1886) who had made a name for himself as a photographer, but he died prematurely. In 1895 his widow assigned the business to the Geûens-Seaux partnership, although Brepols is believed to have taken some of Daveluy's plates or lithographic stones and Geûens brought two of the Brepols craftsmen to Bruges. 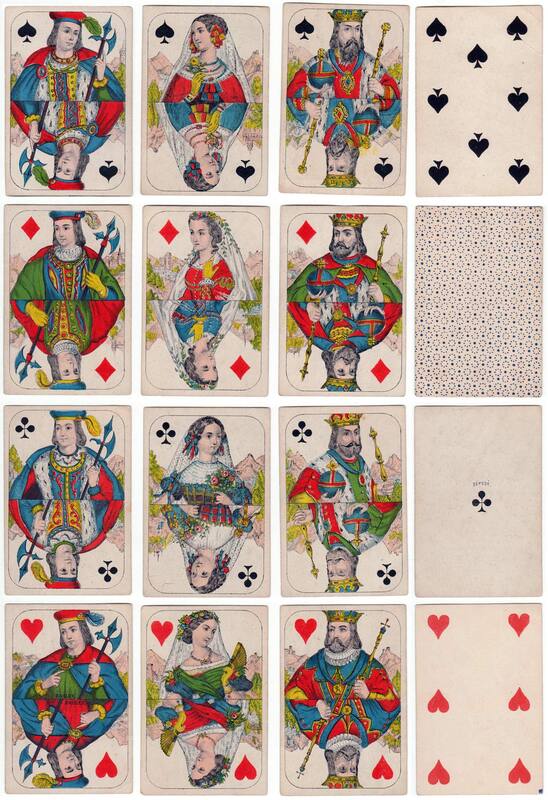 Above: elegant Dutch pattern playing cards by Daveluy, Bruges, c.1880 (click image to see more).